Guess what? Ponds aren't only for the summer. We keep several running well into December most years here in Northern Michigan. As long as you disconnect your water line from the hose bib your water feature can function for months longer than you may have thought. We love this time of the year with our waterfalls and stream. The delicate thin ice that forms overnight creating amazing vignettes. Or on the basalt fountains the ice sculptures that grow, morph and catch the light. It is some great opportunities for photos if you are up early enough and of course bundled! Often the ice will be melted by mid day cleaning the canvas for another nights ice painting to form. Give the gift of a pond, waterfall or fountain to your loved ones this year! Commit to a spring project with a down payment and receive a Free Indoor Container Pond when you mention this #FrogBlog post! 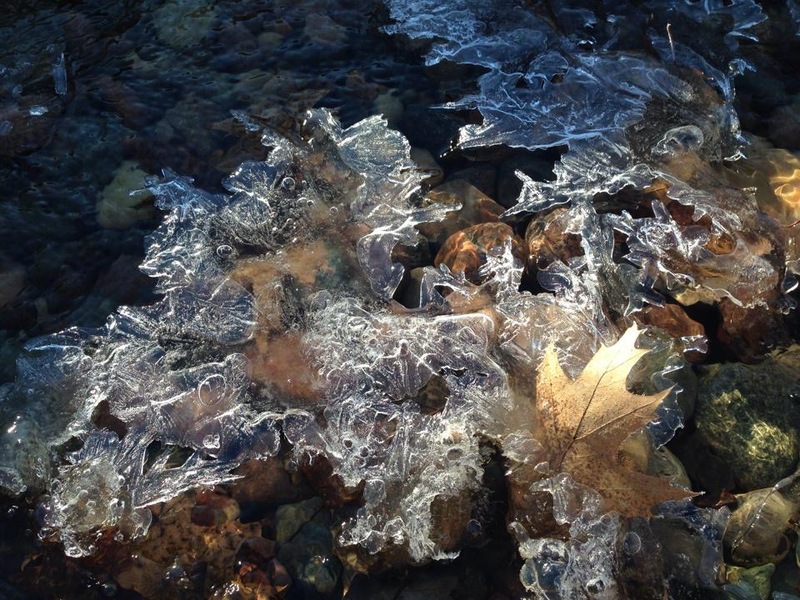 Ice forms over the stream bed and keeps this leaf perfectly placed for the sunrise! Ice towers form above the bowl fountain and are illuminated by the underwater light.